The Collinsville City Commission met Monday April 21st (at the City Hall Community Room, 106 N 12th Street) for a 7pm regular of the Municipal Authority & City Commission. A. Approval of minutes of April 7, 2008 regular meeting. 8. Consideration and possible action on engineering contract for west sewer line. -- the item was tabled to the next city meet, following a presentation by Jay Updike on 4 options for a sewer system to serve to Highway 75 (mainly the last mile and a half there ... including a pending Quick Trip ... as well as other developments currently on hold due to lack of city sewer). The likely option selected was in the range of $2.5 million to with Oct 2009 as the earliest possible completion following design, right of way easement acquisition, DEQ permits and then 6 months of construction. The city is exploring way to fund this needed infrastructure key to west development along Highway 20. The system proposed is primarily a gravity system with expansion requiring some lift stations. POSTED 4/18/2008 at 4:00 p.m. by Angela Long, City Clerk. C. Cemetery Deeds: Susan Catlett, 5 spaces; Michael Shanks, 2 spaces. 7. Consideration and possible action to approve AT&T Agreement, IP enabled Video Service. -- -- approved following a presentation by AT&T's Rhonda Sellers on a new U-Verse product to be available later this year in Collinsville. The new service would provide video services over copper (3000-5000 ft max) and over fiber where available. AT&T would pay the city a 4% fee for services used within the city limits matching the cable TV franchise fees for similar services but noting the AT&T service is not subject to a franchise. The new product is already in place in the Oklahoma City area. Jenks, Owasso and Sand Springs have recently approved the service in their communities. The AT&T network for this capabilty would be expanded with fiber in newer develpment areas and use mostly copper in existing service areas. 9. Consideration and possible action on Debris Removal Bids. -- The bid by Crowder Disaster Recovery was approved. The bids were split with both the city park and city right-of-ways seperate. It is estimated that ~25,000 cubic yards of brush remain to be removed. The 1-day effort Saturday with both county and city crews working April 19th removed about 2500 cubic yards of limbs and downed trees. The bid was for a 60 day completion but might be done in less than a month when started. 10. Consideration of any new business, which can be considered an emergency, to come before the Collinsville City Commission not known about or which could not have been reasonably anticipated at the time of posting this agenda. 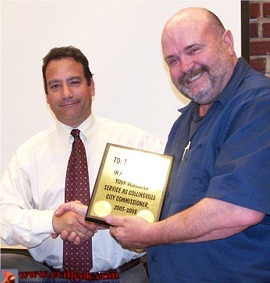 -- The Mayor and Commission thanked out-going City Commissioner Trent Rogers for his service to the city. Mayor Stan Sallee presented a plaque to out-going City Commissioner Trent Roger (right) for his years of service to the City of Collinsville. New Ward 2 City Commissioner Bud York will be sworn-in in May. 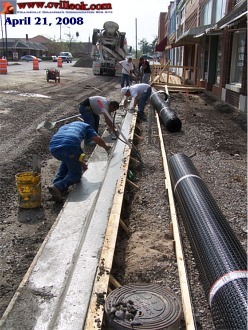 The initial curbs were formed today between 11th & 12th on the north side of Main Street as part of the TEA-21 Main Steet Beautification Project.